Last night as I was racing to a friends book launch I was thinking about the commitment my friend had made to following a dream and the hard work and sacrifices it entailed. My friend has been around the publishing industry in one way or another all her working life. She is married to a book designer. As a reviewer and writer she knows how hard it is to get a book in print and that is the easy job compared to getting marketing, reviews and ultimately sales for that book. The book is beautifully produced as befits a couple of very hands on creative types and is very funny. It rockets along with the hero, Spencer Fogle, outwitting wrestlers and wrestling with genetically engineered carnivorous plants, feckless parents and a Mr Nice Guy former child star who is not very nice at all. The illustrations Sabrina Malcolm has provided sprinkled throughout the book add the finishing touch to a mystery thriller just right for confident readers 8 thru to 12. 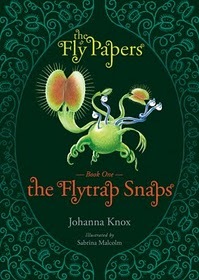 I take my hat off to The Hinterland Press Team, Johanna and Walter, for their courage and tenacity in following their dream to bring us a new midgrade hero...(heroes...Dion the talking Venus Fly Trap has my vote as well.) I wish them well and may they have many sales! Roni Loren has written a great list of ten things she would do differently (and why) if she was starting out to build an author platform now. Joel Friedlander has written an interesting post about authors getting into video blogging. He has some compelling arguments about why we should and lays out step by step how to do it. It opens up a whole new world for the children’s writer....I was recently talking with a school librarian who told me that Book Trailers were one of the biggest selling points for a books popularity in her school library...just let your mind dwell on that for a moment and then go read what Joel has to say. Jami Gold has written another thought provoking post on whether children’s books should have a rating system. I sit on the fence mostly on this one. However there are some books that eight year olds, no matter how advanced their reading is, should not be delving into because they lack the life experience to make sense of what they read....and usually they find this out pretty quickly. I wish parents would think about this before they encourage their very bright reader to tackle a young adult book because they can read it! The Great Jane has another good post looking at ebooks. 5 things beginners need to know about epublishing. Jane has written a quick overview of terms and how to’s. The SCBWI LA conference has wrapped up and again the conference bloggers did a marvelous job of blogging the whole conference. For a wonderful conference experience drop over to their conference blog go down to the bottom and work your way up. If you are an illustrator make sure you look at all the illustration links....there are some superb illo’s and interviews with the best in the business. If you are a writer, check out the in depth interviews. A key note speech I wish I had been there for was the great Bruce Colville...Check out this wonderful report where Bruce talks about the Ha Waah Yikes method of story crafting and what makes a good story. 5 Simple Steps To Create An Audio Book...this is a great resource. Bob Mayer asks the question, I will do whatever it takes to be a writer, except don’t ask me to do...? Helen Lowe is having a Thornspell contest on her website. You get to suggest one of her characters and why they should have a stand alone story written about them...three judges get to pick the best one...and she has to write it. Winners get a copy of Thornspell...It’s a great book too...think sleeping beauty then tell it from the princes point of view but add some twists! Helen is living through the constant earthquakes in Christchurch and although times are tough down there she is hanging in there writing and publishing from the very shaky city....That’s commitment! Thank you so much for the awesome plug Maureen!!! Can I link to it?